Updated: Jan. 22, 2017 at 11:25 a.m. This post was written by Hatchet reporters Dani Grace, Cayla Harris, Johnny Morreale and Weizhen Li. 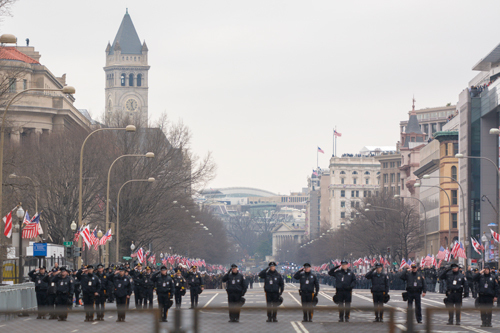 Thousands of people lined up along Pennsylvania Avenue to watch the inaugural parade Friday afternoon. “He has a knack for really connecting with the crowd and he really went out all presidential,” Walker said. Sam Waters, a 14-year-old from Alexandria, was watching the parade with his father who wanted his son to witness history in the making. “It is amazing to see everything and watch it all play out. I felt very patriotic after his speech and I wasn’t expecting that,” the younger Waters said. Along with a military procession, Boy Scouts of America, Texas State University Strutters, the Talladega College Band and the West Monroe High School Marching Band also performed. Russ Crosby from Wilson, North Carolina said he was surprised by how peaceful the day was after a divisive election. “I felt really patriotic at the inauguration. It was really positive. Everyone was really civil, I was expecting more,” Crosby said. Brittany Rolle, a student who came to support the band from Talladega, Alabama, said it was a surreal experience to be represented despite the controversy within their school about performing for Trump. While most people who lined the streets were there to show support for the new president, some came to protest. Earl Lin, a 24-year-old from Arlington, held a sign reading “First Amendment” and said he was there to make sure people remember to hold the Trump administration accountable. Lin added that he was surprised that despite the presence of protesters, the mood remained civil. “While we were waiting in line to get to the security zone we talked to some people that had different views about religion and politics than we do, but we had a very civil conversation which I appreciated,” Lin said. “I did not appreciate it when people yelled slurs at us or curse words, but that’s their right. Diane Stephens, a Trump voter from Round Hill, Virginia, said she found it disheartening that protesters chanting slogans like, “Trump is racist, love must win,” were also at the protest. The event also attracted tourists from around the globe. Reuben Ramsay, who is from Australia said Trump has not only influenced Australian popular culture but also politics as politicians abroad move in line with more conservative parties. Tom Booster, a Dutch citizen, said he was surprised at how peaceful the parade was considering the news in Holland presented it as if there would be much more protest on the route. “It is a historical event. If it is going to be a good event, I don’t know. But I wanted to be here to watch history,” Boostra said.